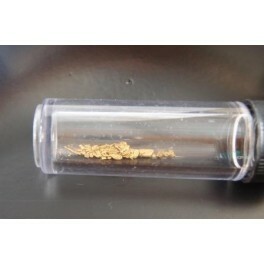 Alluvial gold. Approximately 0.25g in a vial. Alluvial gold dust is transported by sedimentary mechanisms in river systems and commonly obtained by panning in sediments deposited by the river. The source of this specimen is the Gympie area.